Saturn's largest moon, Titan, is in the background of the image, and the moon's north polar hood is clearly visible. See PIA08137 to learn more about that feature on Titan (3,200 miles, or 5,150 kilometers across). Next, the wispy terrain on the trailing hemisphere of Dione (698 miles, or 1,123 kilometers across) can be seen on that moon which appears just above the rings at the center of the image. 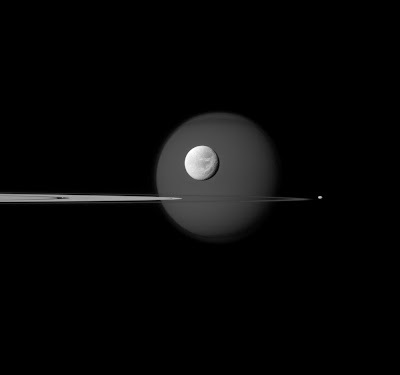 See PIA10560 and PIA06163 to learn more about Dione's wisps. Saturn's small moon Pandora (50 miles, or 81 kilometers across) orbits beyond the rings on the right of the image. Finally, Pan (17 miles, or 28 kilometers across) can be seen in the Encke Gap of the A ring on the left of the image. The image was taken in visible blue light with the Cassini spacecraft narrow-angle camera on Sept. 17, 2011. The view was obtained at a distance of approximately 1.3 million miles (2.1 million kilometers) from Dione and at a Sun-Dione-spacecraft, or phase, angle of 27 degrees. Image scale is 8 miles (13 kilometers) per pixel on PDione.